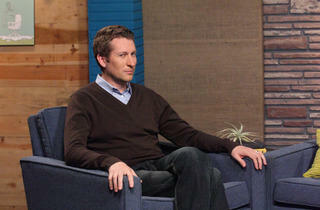 Scott Aukerman has been hosting Comedy Bang! Bang! in some form or another since 2002, whether as a comedy showcase at the Upright Citizens Brigade Theatre, a longform improv podcast or a surreal TV talk show sendup. When he's not busy producing a Between Two Ferns episode with the president, working on the upcoming series With Bob and David (Aukerman was a writer on the beloved Mr. Show) or writing comics for Marvel—actually, we're not sure that leaves time for much more these days. 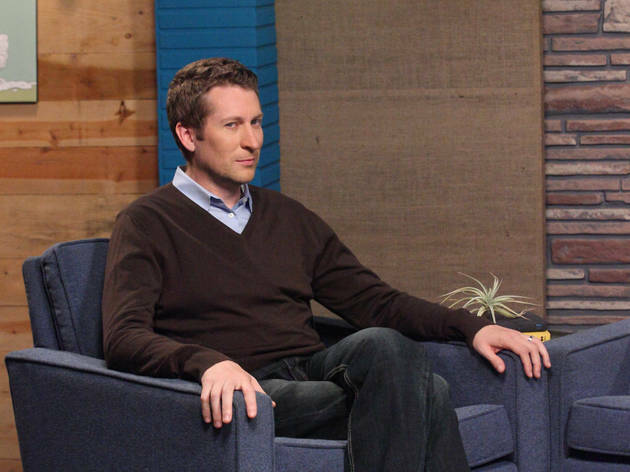 We sat down with Scott Aukerman (or Not Superman, in the spirit of the fake intros on his show) outside of Comic-Con to chat about working with Kid Cudi, coming up with accidental catchphrases like "all joking a salad" and the comedy scene in LA. Are you a Comic-Con regular? I was begging my mom, come on, let's go down, let's go down. In 1985 she let me. And then regularly since '97. That year was with was with Bob Odenkirk, David Cross and Brian Posehn. Bob and David were just kind of making fun of everyone the whole time, and I was like, I like being here. What did you think about the rumors that Comic-Con was looking to move to Los Angeles? I'm not a fan of that. Part of it is just coming to San Diego. If it's in LA, what's special about it? That means I have to go down to Downtown LA one weekend. How fun does that sound? It's way more fun to say, hey let's go down to San Diego. This is beautiful. You're right by the ocean. Why would you want to change this? Kid Cudi replaced Reggie Watts as the new bandleader on this week's Comedy Bang! Bang! The way Cudi was introduced—it was enjoyably self-deprecating. When Cudi got the script—you know, he's excited to work on the show and he’s, like, hype about it—and then he gets the script and it's essentially where I don't like him and don't want to be there. Because for me, I kind of had to play audience surrogate. I knew that there would be a lot of people watching the show going, I don't want Reggie to leave, I don't like change. And so I wanted to do an episode where I was acting like that and it makes you feel really bad for Kid Cudi because I'm treating him horribly. The show has become increasingly ambitious over its run; you had one episode that was entirely a musical. Are you planning anything else like that? Our sixth episode coming up, every act is done in one uninterrupted shot. That was really tough. Tom Lennon is the guest on that and Paul F. Tompkins is Andrew Lloyd Webber. I don't want to spoil exactly what happens, but aside from just doing everything in one take without any edits, we are also performing feats that are really difficult to do. That mystery layer aside, that sounds similar to the podcast. It is, especially when Paul gets out there as Andrew Lloyd Webber; it's very similar to the podcast in the sense of the rhythms of it. Without an audience on the podcast, how do you know a bit is going to work well? With something like “heynong man,” it's a flub that comes up spontaneously in the first few minutes but ends up becoming the focus of the episode. I think it's just using your own taste. I've become better at figuring out how to exploit something like that, embracing the mistakes. A lot of times in the early days I would've said "heynong man" or "all joking a salad" and been embarrassed and been like oh, I fucked it up. And now I'm like, oh that's great. Let's talk about how I just messed up and I said "all joking a salad" and it becomes a thing. Do you think that LA has become a podcast town, so to speak? Every three houses there's basically a podcast studio now. Were you influential in that? I would tell comedians, hey, you should really do a podcast. And they'd go why, no one listens to those, I want to do a live show in front of a hundred people who are all excited to see me. That seemed sexier or more fun to them. And I would be like, no I think podcasts are really going to be something. I'm glad that I was right in that sense. Now all comedians want to have one. So, you know, am I a pioneer? Sure. You've written stories recently for Deadpool and Secret Wars Journal. Do you have any plans to write comics outside of the Marvel Universe? I don't have any plans to write anything, it's just finding time. But I'd like to write something. There is a U2 comic book that a fan sent me. So I think that's already been done, unfortunately. I don't know if anyone's done a Mr. Show or Comedy Bang! Bang! comic. That's true. Maybe a Comedy Bang! Bang! comic book. Or the Comedy Bing Bong Con. Scott Aukerman performs ("Perhaps something musical...") with Paul F. Tompkins at Largo on July 11. Comedy Bang! Bang! airs Thursday nights on IFC at 10:30pm.